Fables: An ELA Common Core Unit is a three week unit that includes reading five fables that are included in this unit, filling out graphic organizers that expand students' knowledge of story elements and ability to interpret morals, writing an opinion piece, writing an original fable, and developing vocabulary. This unit also includes rubrics for assessing each assignment. 1. Students will read multiple fables. 2. 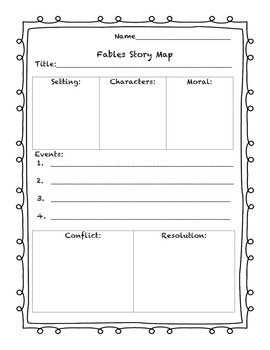 For each fable read in class, students will create a story map with a partner highlighting the setting, characters, moral, important events, conflict and resolution. 3. Students will create a chart listing the title of the fable, the moral of each story, and an interpretation of the meaning of the moral. 4. Students will participate in a discussion with classmates analyzing different morals and making connections to everyday life. 5. 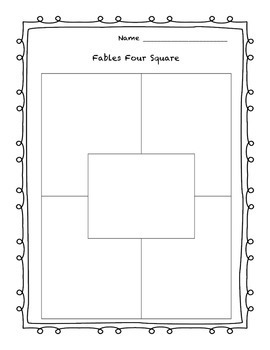 Students will create a four square graphic organizer and, from that, write a paragraph expressing their opinion on which moral is the most meaningful to them, and support their opinion with details from the fables that they have read and/or from their personal life. 6. 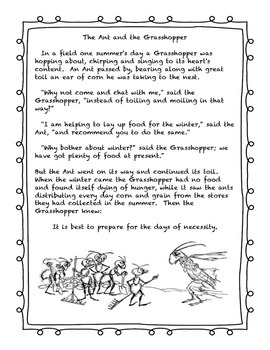 Students will write their own fable using a moral that they feel will be the most helpful for a younger student. 7. Students will use context as well as other sources to find the meaning of a word or phrase. 8. Students will have fun! Please rate me if you find this unit helpful to you. 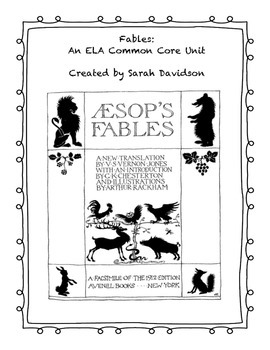 Fables: An ELA Common Core Unit by Sarah Davidson is licensed under a Creative Commons Attribution-NonCommercial-ShareAlike 3.0 Unported License.